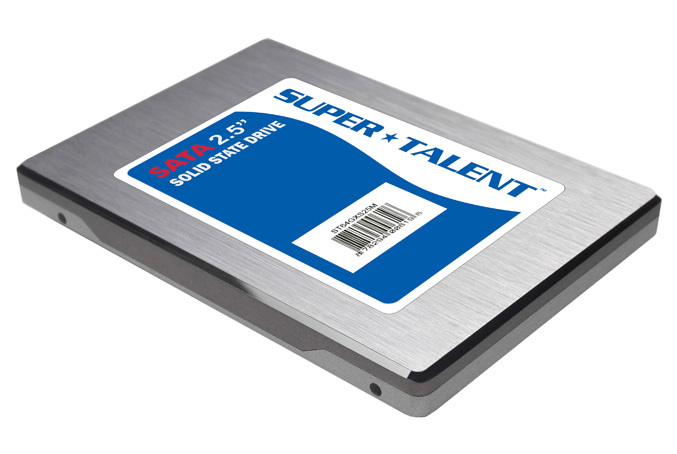 Super Talent Technology, a leading manufacturer of Flash storage solutions and DRAM memory modules, today launched a new line of MasterDrive SX SSDs that incorporate 128MB of DRAM cache and reach new performance levels in high performance laptops. The MasterDrive SX is based on an advanced new 8-channel controller and MLC NAND Flash. Its 8-channel architecture combined with a hefty 128MB of DRAM cache takes full advantage of the 3Gbps SATA-II bandwidth. The MasterDrive SX is capable of sequential read speeds up to 220 MB/sec and sequential write speeds up to 200 MB/sec. MasterDrive SX SSDs have undergone thousands of hours of intensive validation and stress testing in both Windows® and LINUX environments to emerge as one of the most reliable SSDs available. These drives are encased in a sturdy yet lightweight aluminum shell that protects the drives against physical damage. MasterDrive SSDs are dramatically more resistant to shock and vibration than hard drives. Another great advance in the MasterDrive SX is its power efficiency. The drive sips a mere half a watt of power in read mode, and 0.15 watts while idle. That’s considerably lower than typical notebook hard drives, and even lower than the vast majority of 2.5-inch SSDs. The benefits to users are less fan noise and longer battery life. “We developed the MasterDrive SX series to offer extreme reliability at an aggressive price point that makes sense for mobile professionals and enthusiasts. Moreover, these drives boast power efficiency and write speeds that few SSDs can match”, said Super Talent Director of Marketing Joe James. MasterDrive SX SSDs are available now in capacities up to 256GB through NewEgg and SuperBiiz. Street prices for the 128GB drive are around $359.